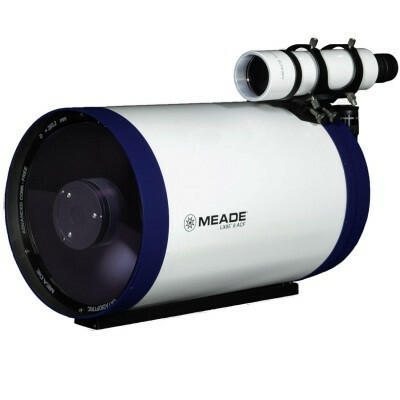 The ASCENT 102mm F11 ED Doublet refractor optical tube is optimised for detailed observation and imaging of the Moon and Planets, with a quality 4 inch aperture it can still show deep sky objects well. An evolution of the well respected "Red Tube Classic" Starwave 102 Achromat, now with ED optics and improved mechanics. The result is improved colour correction and contrast thanks to the latest generation of affordable ED optics and anti-reflection coatings. It a geared focuser replaces the original Crayford style focuser allowing for heavier accessories, and the tube can be broken down offering 270mm of backfocus for binoviewing. The ASCENT 102mm F11 ED is particularly effective for visual observation of planets, the moon and double stars and it copes with turbulent air (seeing) extremely well due to it's long focal length. It is also a very capable solar imaging telescope (with the appropriate filter) for white light (with the Altair Solar Wedge), and of course Hydrogen Alpha. It is easy to focus due to the extended depth of field and gives extremely sharp images. 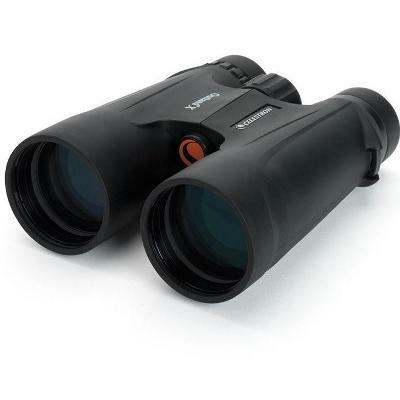 The long focal ratio minimises eyepiece aberrations, resulting an extremely flat field of view. 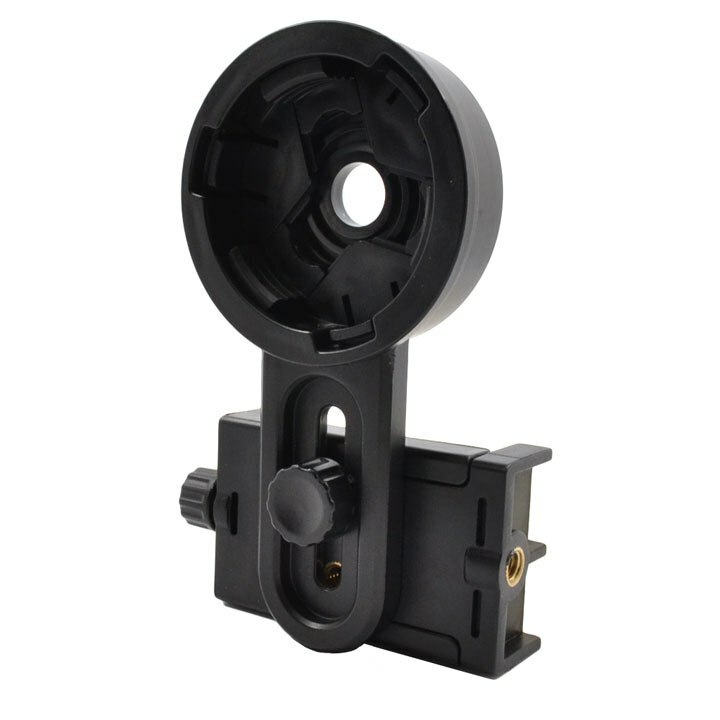 Binoviweing is easy - just detach the focuser and unscrew the mid-section, then screw the focuser back into the tube. No tools are required to break the scope down for travel. When compared to Achromatic refractors of similar size, length and focal ratio, the Starwave 102ED offers better geared mechanics for easier focusing, and truer colour rendition thanks to the ED optics. 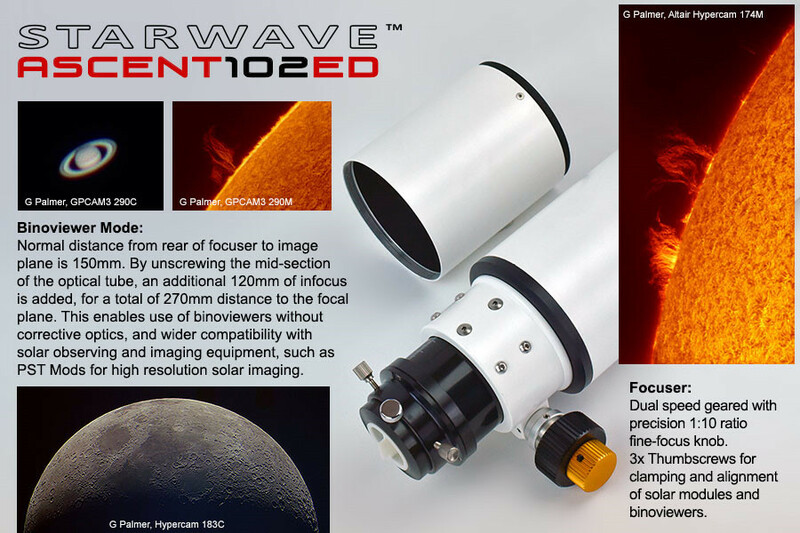 The Starwave 102 ED delivers a sharp "contrasty" image with good colour correction and tight star images. The 80mm aperture gathers about 63% more light than an 80mm refractor and the brighter image shows more detail. 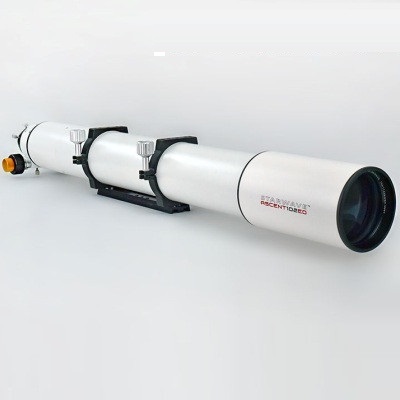 With a higher power eyepiece or Barlow lens, this telescope will show details withing the planetary disc of Jupiter, the Great Red Spot, cloud bands of different sizes and textures, as well as the four largest Galilean moons and their shadows cast on Jupiter. The contrast is very good enabling you to see a jovian moon against the brightly lit background of Jupiter. Saturn's rings and Cassini division are easy to see at higher magnifications and cloud bands are visible on Saturn as well as the polar caps. Mars shows surface features and polar caps easily. Thousands of craters are visible on the moon - enough for a lifetime of observation. 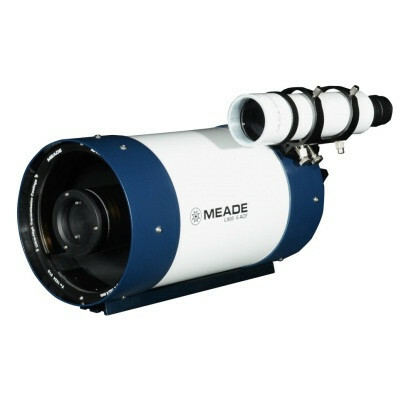 Customers often reported the previous "Classic Red" Achromatic version of this telescope outperformed reflectors of 6 and 8" on planets and the moon in contrast and suble detail. The ED version improves on the "Classic Red" version both optically and mechanically with a modest price increase. The convenience of a refractor. This is the perfect scope to take out and just observe with. It cools down fast thanks to the aluminium tube and long focal length doublet objective design. Unlike reflectors, the optics do not require frequent collimation (alignment) before use, so the product is virtually maintenance free aside from the usual yearly cleaning of the lens. 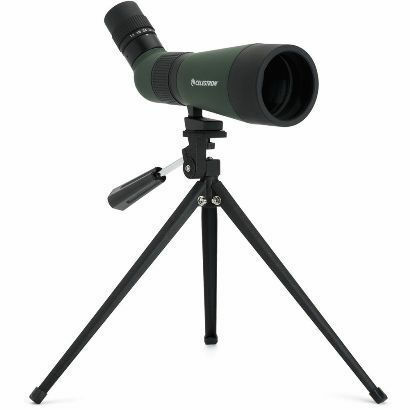 By adding an optional image-erecting prism diagonal, the Starwave becomes a real performer when it comes to terrestrial and nautical observation, offering performance in the same category as ED spotting scopes costing many times the price. Simply increase the brightness on the Red Dot Finder and you can use the scope with pinpoint accuracy during daytime.